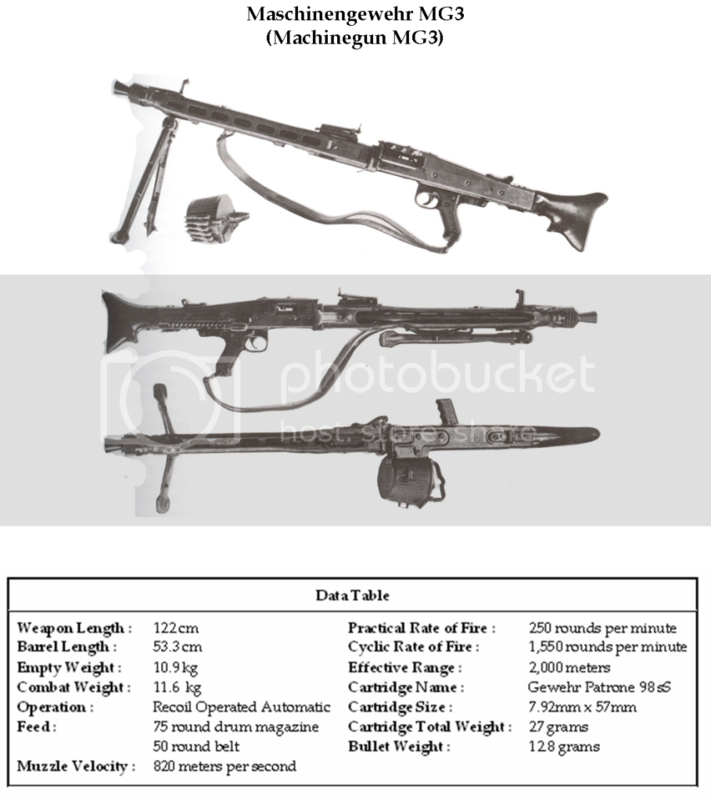 A listing of standard issue German small arms, for the Heere, the Kriegsmarine, and the Luftwaffe. 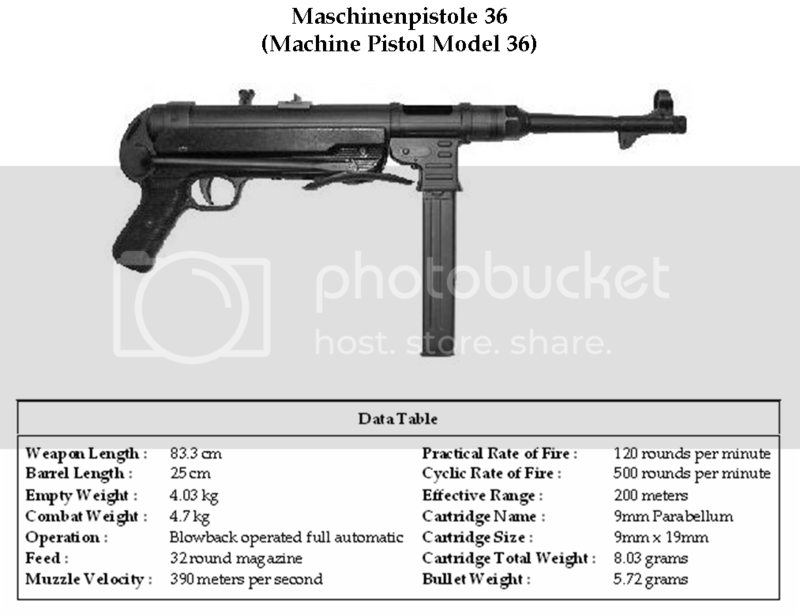 The Machine Pistol Model 36 was designed by Berthold Geipel of the Erfurter Maschinen und Werkzeugfabrik firm in 1935 in response to a joint Heer and Luftwaffe requirement for a light automatic weapon suitable for use by parachutists and vehicle crews of the expanding Panzertruppen. It drew upon earlier work of Heinrich Vollmer but was constructed primarily of stamped steel rather than machined parts, and employed electro-spot welding as much as possible. A handguard, made of a synthetic material derived from bakelite, is located between the magazine housing and the pistol grip. German soldiers are trained to grasp the handhold on the underside of the weapon to avoid burns from an overheated barrel. While widely issued to Luftwaffe paratroopers, in the Heer issue is restricted to platoon and squad leaders, or to vehicle crews as a defence weapon should they be forced to abandon their vehicles. Proposals have been brought forward to expand the issue of the MP36 more widely throughout the Heer, though these have been resisted up to the present time. The weapon is currently in production and is available for export to friendly countries. 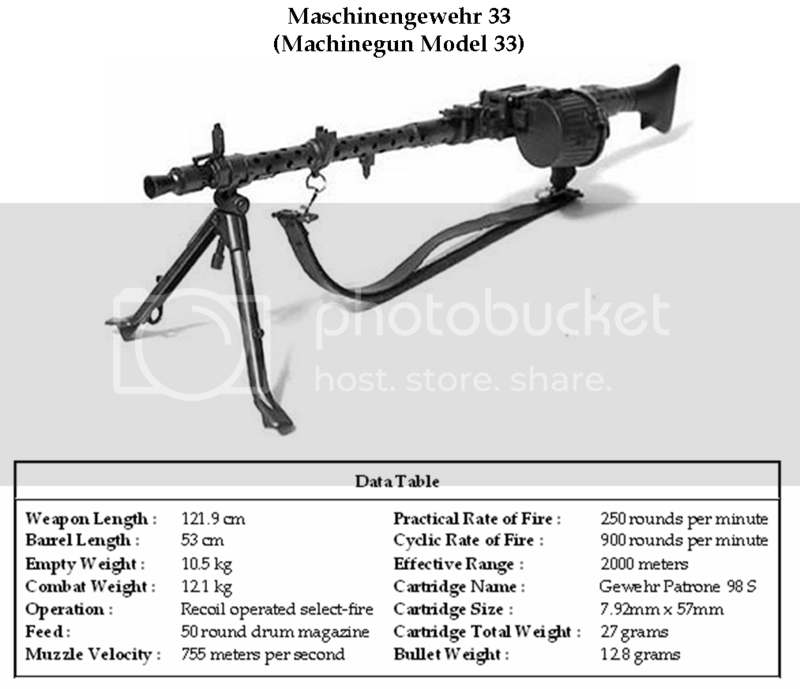 A derivative of the Machinegun Model 33 for use as a secondary weapon on armoured vehicles was the Machinegun Model 34. This featured a heavier barrel more suited to sustained fire and the ammunition feed was changed from 50-round drum magazines to 250-round belts. As such the Machinegun Model 34 is used as a standard secondary weapon on the Heer’s tanks, armoured cars and other armoured vehicles. The Carbine Model 37 was introduced to Heer service after a lengthy process of testing in the middle 1930s. Developed by the Swiss firm Waffenfabrik Solothurn it featured the new 7x40mm lightweight cartridge. 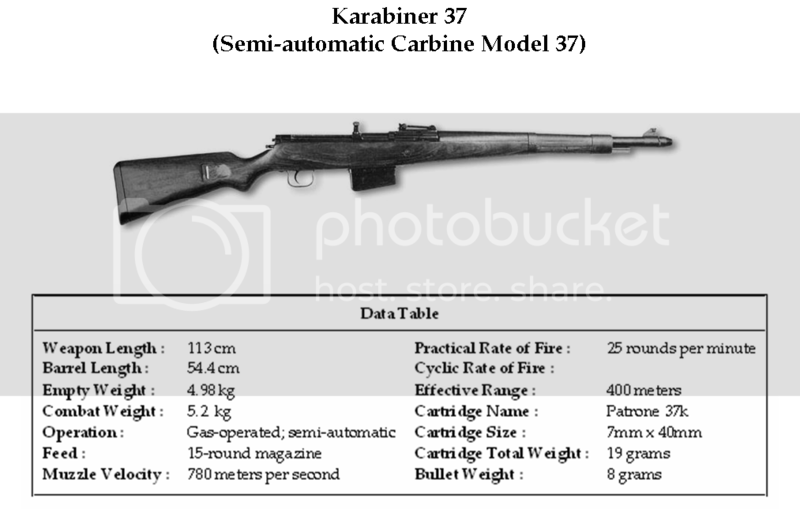 Adoption of the Carbine Model 37 was not without opposition within the Heer and within the Reichstag, but adoption of semi-automatic weapons by several of Germany’s neighbors prompted a selection that some consider premature. The weapon has been adopted as the Heer’s primary service rifle, and production has been continuing at a high rate. However, certain technical issues have prompted calls for its replacement by a weapon more suited to the Heer’s requirements. The Mauser designed G-11 rifle was adopted as a specialist weapon for the Marinelandungsverband and Marinesicherungsverband of the German Kriegsmarine. It was procured in limited numbers from 1944 onward. These two weapons are considered standard issue by the Heer; officers are permitted to purchase and carry sidearms of personal choice. The Pistole 08 is no longer in production; current procurement is limited to the Pistole 36, manufactured under license from Fabrique Nationale of Liege. Developed by the Mauser-werke in response to Heer requirements for a light automatic weapon to replace the MP36 submachinegun as well as the G5 rifle in certain units. This weapon uses the new Polte 7.92x45mm intermediate cartridge. 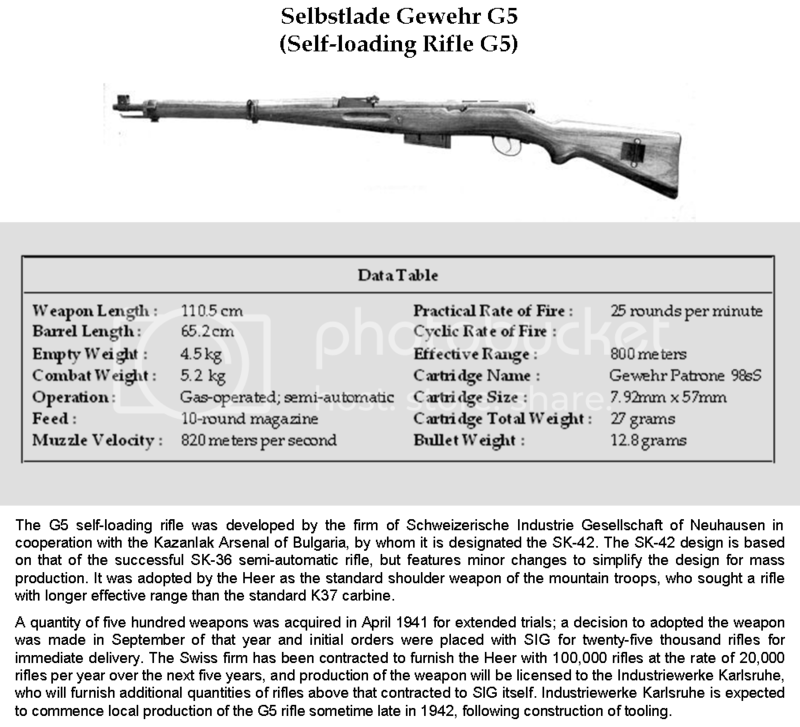 Trials in the spring of 1948 established the superiority of the Mauser submission and low-rate production of the new G6 rifle was underway by the close of that year.